All students are required to run a current version of the Windows operating system. Once your tuition deposit is processed (allow 5-7 business days), a MyDeacNet account will be created for you. You will receive an activation e-mail from help@wfu.edu to the personal e-mail account you listed in your application. You must activate your MyDeacNet account within 10 days of receiving this e-mail. For your security, you will be required to enter your account activation code as well as provide information from your initial application. Haven’t received your activation e-mail yet? Please check your spam or junk mail folder for an email from help@wfu.edu. Need assistance activating your account? Please contact the School of Business Help Desk at 336-758-4126 or sbhelpdesk@wfu.edu. You will NOT receive an account activation e-mail. Please continue to use the same username and password that you used as an Undergraduate student. WFU Google Mail | http://google.wfu.edu – Your Wake Forest University Google Mail account will be your official e-mail address that the University will use to communicate with you. Use your full email address and password to log in. WIN (Wake Forest Information Network) | https://win.wfu.edu – WIN provides students with a variety of tools to view their grades, access online bills and search directories for students, faculty, staff and alumni. Use your full email address and password to log in. Please log out of your personal gmail account prior to logging in. Sakai | http://sakai.wfu.edu – Sakai [sah-kahy] is Wake Forest’s online Collaboration and Learning Environment. Many instructors will use Sakai to post announcements, assignments, and quizzes. Use your username (without @wfu.edu) and password to log in. All students are required to run a current version of the Windows operating system. 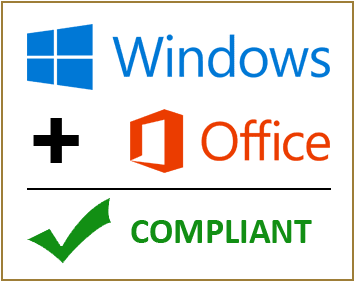 The School of Business has standardized on the Windows operating system for two primary reasons: 1) to ensure compatibility with required course software and 2) the Windows operating system is the predominant operating system used in business. The specifications listed below will meet your computing needs during your tenure at Wake Forest University. Depending on the security settings on your work laptop, you may experience difficulty connecting to the wireless network, installing printers and/or installing software. Students who work in the banking and healthcare industries tend to have the most problems with the security settings on their work laptops. If you or your IT Department have any questions, please contact us at 336.758.4126. How do I check my PC specifications? Students are strongly encouraged to use a PC instead of a Mac. However, if you prefer using a Mac, you must also run the Windows operating system and Office for Windows in order to support the software required for your courses. How do I check my Mac specifications? As a student, you have access to free or discounted software. OnTheHub is the online software distribution partner for Wake Forest University. Students are eligible to download software packages for little or no cost by visiting http://wfu.onthehub.com. Windows 8/8.1 & Windows 10: Windows Defender is included in the operating system.